This book and the next book in the series (Armies of Hanuman) have been with me for over 4 years now. I don’t know what took me so long to read this one especially when I totally loved reading the first two books of the series. I get lesser time to read these days and after not reading a single page for days at a stretch, I started longing to read something. That’s when I decided to read the books that have been sitting on my shelf untouched for long. Ashok Banker has weaved magic through his books on mythology. In his Ramayana series, he has taken the liberty to use his own imagination and innovative story telling in narrating the epic saga. So, prospective readers keep in mind that this is not the so-called original version but a somewhat spiced up version of Ramayana. The author has made the reading experience a lot more dramatic. The previous book of this series concluded with Rama using ‘Brahma Astra’ to annihilate the Asura army that were all set to attack the city of Mithila. In this book, the story progresses further. Rama and his newly wedded wife Sita are welcomed in Ayodhya in all pomp and glory. While the citizens are all jubilant there is something not right in the palace – Asura sorcery is at play and it will have damning consequences for Rama. The reader is likely to be transported right into the happening in the streets of Ayodhya as he leafs through the pages of the book. The problems of the prince Rama are going to get a new height – a scheming Manthara has got the lust-laden Keikayi in control and soon Rama would leave the royal palace and head to live in the forest in exile for 14 years. The beauty of the book is that even though most Indian readers already have an inkling of what happens in Ramayana, they look forward to see how the author is going to narrate it. There is so much action happening in the book that the reader in you would want to set aside all works and continue with book. However, this book is not without its share of flaws. There are parts in the book, where it seems that the author has gone overboard in describing the details of an incident and there are parts which seems rushed upon. For example, the demise of Manthara has been written in details but the passing away of Dasaratha were described in a few lines. Also, at times the narration in the book faltered. I would have liked it better if the pace of storytelling did not vary too much. 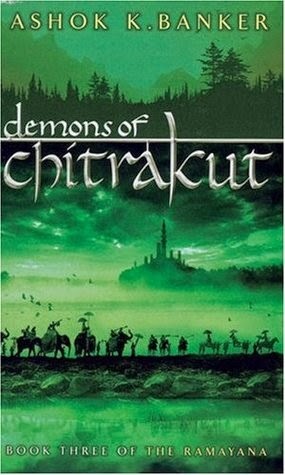 Another thing that kept me reading the book was to find out about the demons of the Chitrakut. As it is the title of the book, I was hoping that they would be central to this book in some way. However, it is only near the very end of the book does the reader get introduced to these demons. Where and how – it is something you will know when you read the entire book. Even though I can go on and on about what await you in the book, I sincerely think that you should better read it to find out more. Even with all its flaws, it is a great read and will keep any mythology lover hooked. I am also finished with the book 4 of the series – Armies of Hanuman and will write about it soon. So, stay tuned and happy reading.